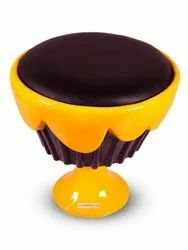 Pioneers in the industry, we offer ice cream cup cake chair/ stool- black, exclusive ice cream chair/ stool - yellow, ice cream shaped chair and ice cream shape - set of 1 table and 1 chair from India. 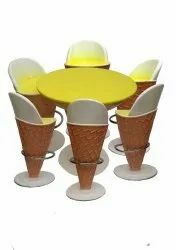 This spectacular Ice Cream cupcake shape chair is one of the unique product made by Waahkart. It gives a very pleasant look and this product is rarely seen which makes it different. Noticeable and gives Wonderful look when it placed in Ice cream parlor, Garden, Hotels, Restaurants, cafeteria, Kids room, lawn or in the party hall. Very attractive for Children. Approx dimensions: Height- 21 inch, Width- 18.5 inch, Depth- 18.5 inch, Weight- 12.5 kg. 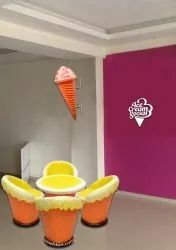 Get this amazing Ice cream chair which surely noticeable and gives wonderful look when placed in your Ice cream parlor, Garden, Hotels, Restaurants, cafeteria, Kids room or in the party hall. It gives a very pleasant look and its fine finishing is rarely seen which makes it different. Very attractive for Children. Approx dimensions: Height- 21 inch, Width- 20 inch, Depth- 20 inch, Weight- 8.8 kg. 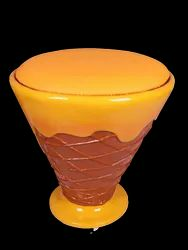 Looking for ice cream parlor accessories ?